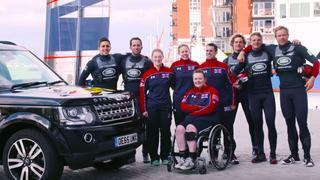 The UK Team for the 2016 Invictus Games joined a training camp with Land Rover BAR at their America's Cup base in Portsmouth. The Invictus Games team were given an exclusive insight at how the world’s top sailors train at the highest level. The Invictus Games is a Paralympic style multi-sport event for injured, wounded or sick armed services personnel, which will take place in Orlando on May 8-12. By then, Sir Ben Ainslie and his Land Rover BAR team will have competed in the America's Cup World Series New York City, on May 6-8, as they attempt to continue their journey to bring the America’s Cup home. “We are honoured to host members of the UK Team for Invictus Games Orlando 2016 in Portsmouth today," said Land Rover BAR team principle and skipper Sir Ben Ainslie. "Like us, the Invictus Games team is in the final stretch of preparation for competition in America and it was really enjoyable mixing our training session to get insight into how they train individually across their own disciplines. “As a professional athlete you give everything you can physically and mentally to succeed – meeting the Invictus Games UK Team members and hearing their personal stories of overcoming injury and trauma as a result of their services career, you realise that they go above and beyond to deliver on the sporting stage. Invictus Games is hugely inspiring and highlights the true power of sport in giving individuals strength and focus. Everyone at Land Rover BAR wishes the team well in Orlando and we hope to both return to the UK on back of success in the US,” added Ainslie. For UK Team swimmer Zoe Williams, who was born and raised in Portsmouth, it was a great experience to compare the different training methods and learn from the world’s best as she begins her own personal journey through sport. She said: “Invictus Games has given me an opportunity to train and develop as an athlete but also meet and learn from some really inspiring people. Rehabilitation is very personal but I think all of the UK Team members preparing for the Games are benefitting from that sense of focus and purpose. To have the support of world-class athletes like Sir Ben Ainslie and the Land Rover BAR team is fantastic and we are all even more motivated to succeed in Orlando after today." More than 180 military personnel and veterans trialled 10 sports for one of the 110 places available in the UK Team. The rigorous selection process was based on the benefit the Invictus Games will give an individual as part of their recovery, combined with performance and commitment to training.